Fire is extremely important when you are outdoors, whether camping or hunting. Only a true outdoor enthusiast knows the vital role that a survival lighter plays. For all you know, it might be the difference between having edible food (there is no Taco Bell down the street; there is no street!) and starving when you are out in the wild. It can also be the thin line between keeping warm and freezing during cold and hard climates. A survival lighter is one of the must-have items in your survival kit and backpack. 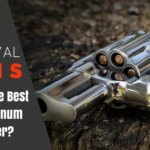 It is critical to choose the best survival lighter for those outdoor trips you take. Nowadays, you will find a wide range to pick from, each with its own pros and cons. You should make sure that you choose a quality survival lighter that suits your needs and purposes. Click to one of the links to go directly to our overview, opinion, and specs of each lighter. When you are out in the great wide open, there are different types of climatic phenomena that can be against you, such as rain and snowstorms. In situations like this, it is crucial that you have a suitable quality survival lighter to help you in such extreme conditions. It is, therefore, critical to making the right choice when it comes to survival lighters. Uses: One of the first things you need to consider is the usage of the lighter. This type of lighter is not just used for lighting campfires especially when you are in the wilderness. There are many unexpected things that can take place in the wild, so you need a high-quality survival lighter that can function in different conditions and situations, even the tough ones. Matches work well for lighting fires, but you are out of luck if they get wet due to rain or if you have to cross a stream and they get wet, that is not good when that happens! Butane lighters are terrible too but tend to be pretty unreliable in cold conditions. You will find wick-based lighters which many people like as they work well in the cold, but they can be a problem as their fuel often tends to leak. The bottom line is that every type of lighter has its own set of pros and cons. This is why it is a poignant idea to keep a number of different lighters to serve you well under different conditions when you are out in the wild. Waterproof: Nowadays, there are waterproof lighters that have a protective covering that keeps air and water out. 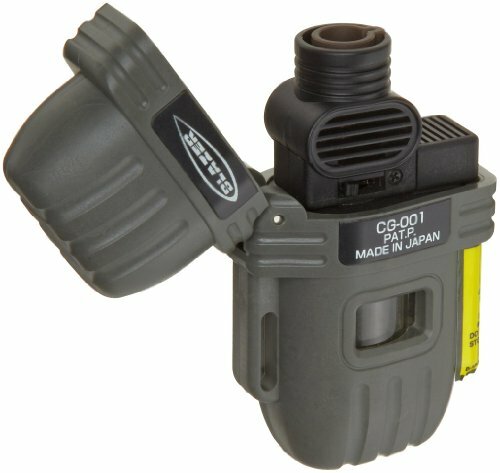 This is a vital feature as it ensures that you have a perfectly functional lighter even if it rains heavily and your gear gets soaked, or the lighter gets submerged in water for some reason. Durable: When you are out on your outdoor trip, the last thing you want is a lighter that breaks as soon as it falls on the ground. It is best to spend your money on a survival lighter that will last a long time. Choose one that is strong and tough and can also sustain impact and weight without any problems. 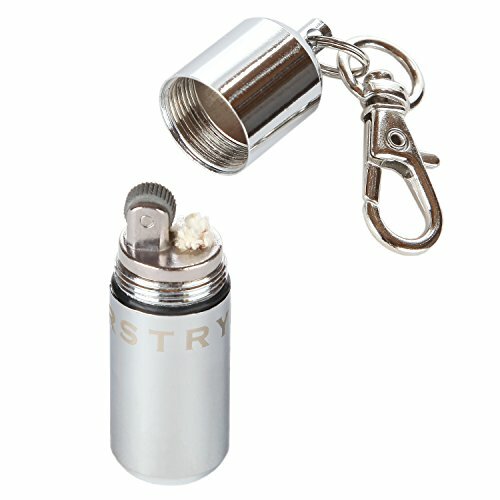 Stainless steel lighters are an excellent choice as they do not rust even with prolonged use. Portable: This is another critical feature to look for. Being part of your survival gear, you will definitely want to keep it close to you at all times. 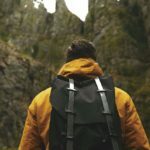 It should not take up too much space in your backpack or survival kit and be compact enough to fit in it so you can easily carry it around with you – whether it is for long hiking trips or as an emergency item. Direct Flame: Many users tend to forget about this aspect of a survival lighter. A regular lighter, more often than not, is unable to work in rainy or windy conditions. In such situations, you will be thankful for a lighter that has a direct flame. These torch-like flames can be used in various conditions without the need to worry about its efficiency or safety. Hands-Free: Although this is not a feature that is compulsory, having hands-free lighting can be helpful out in the wilderness or survival situations. These days you will find multi-purpose lighters that do more than light a fire, freeing up your hands for other tasks. Also, hands-free versions of survival lighters act as a source of heat which can be highly useful at times. 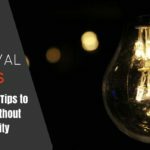 By looking for these features in a survival lighter, you can make sure that you have one that is useful and reliable in any condition when you are in a survival situation or out on one of your outdoor adventures. When it comes to lighters, one of the top names is Zippo. 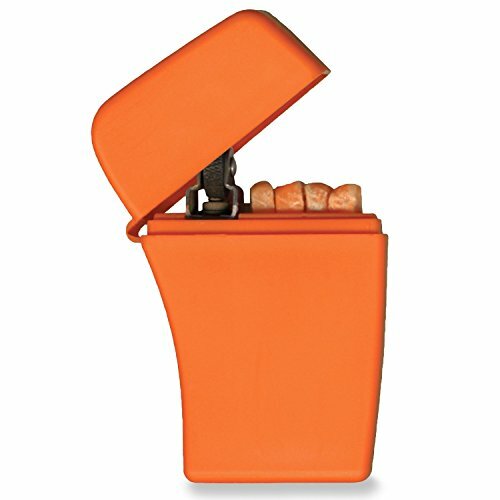 The Emergency Fire Starter is an excellent product that is sure to be reliable in any situation. With a lightweight plastic case, you can easily carry it around everywhere. It has a water-resistant O-ring seal that keeps the lighter fluid and parts dry. The reliable flint wheel ignition ensures that it works whenever you need it. The Zippo Emergency Fire Starter comes with 4 waxed tinder sticks with a perforated spine for ease of use. Although you may find the tinder a little difficult to use, this is a quality survival lighter that ticks all the boxes. Opinion: First off, the Zippo Emergency Fire Starter works just as it is intended. It is a quality, reliable product that we really like. 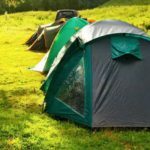 Another great thing about it is how easy it is to use once you get the hang of it – you just need to practice a little before actually using it in an emergency or camping. We believe that is a great lighter for EDC and we are sure it will perform well in a survival situation too. If there was anything that needs to be changed, it would be the quality of the plastic case – it feels like it would crack if it is strained or the weather is cold. Other than this, there are no complaints. Overall, the Zippo Emergency Fire Starter isw excellent for emergencies and a prudent choice for camping/hiking backpacks and survival kits. Jessie Pinkman would probably use it to cook drugs with. Don’t be a Jessie Pinkman! This is a butane lighter that comes with the addition of a nifty built-in bottle opener or a handy 3-foot utility tape that easily tears off and sticks to almost anything. The UCO Stormproof Lighter is refillable, waterproof as well as windproof, making it an excellent product. This survival lighter features an adjustable triple jet flame that can be used easily under any weather condition. With ABS and silicone construction, this product is extremely durable and can hold enough butane for about 700 ignitions. It also features a piezoelectric ignition system which will last for more than 30,000 uses. 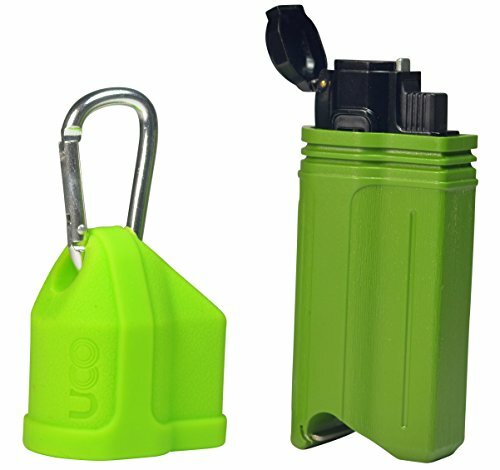 The UCO Stormproof Lighter includes an aluminum Carabiner that allows you to attach it to your backpack or belt. All in all, this is a well-designed, durable survival lighter that has everything you need. Opinion: Let’s start by saying that UCO Stormproof Lighter is an excellent pick for survival kits, camping/hiking as well as EDC. We believe that it is well constructed and one of the top survival lighters available today. Some things to note are the comments that a few customers have about, they say that it is pretty good but not as amazing as others say. However, many users expressed that the lighter is easy to refill, gives you 100% spark with every click and the adjustable flame makes it really useful. A small complaint that we have is the quality of the Carabiner, we think it feels like cheap plastic rather than any type of metal or alloy. Another area of improvement is the attached utility tape’s quality, it is sub par at best and that you cannot do anything that useful with the insignificant amount of tape. But all in all, we can firmly say that the UCO Stormproof Lighter works well and is a great pick. 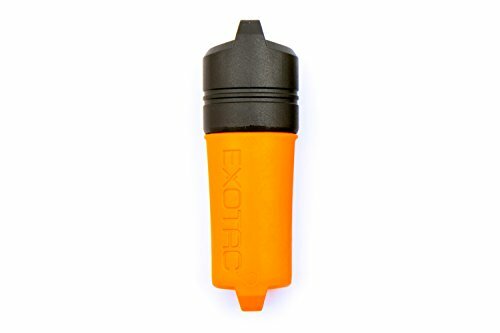 The Exotac Lighter fireSleeve is designed to protect your lighter when you are out on your outdoor trips or in a survival situation. Small problems in an emergency situation or the wilderness can make your lighter unusable. This product prevents that from happening. It is waterproof, even when it is submerged in 3 feet of water for 30 minutes. This does not make it Aquaman but that is still impressive nonetheless. It has a gas lock that keeps your lighter on without the need to hold the gas button, and the fire sleeve also keeps the gas button from being pressed accidentally. The Exotac Lighter fireSleeve is designed, and field tested to make sure that it works flawlessly under even the harshest conditions when you really need it. It is a little expensive, but when you are regularly in the outdoors, it is totally worth it. Opinion: After giving this product a try, you’ll agree with us that the Exotac Lighter fireSleeve is an awesome accessory for your survival lighter. It really works well just like it is advertised unlike the ACA did! It ensures that your lighter stays dry and works whenever you need to light a fire. A great thing to know about it that the fireSleeve is 100% waterproof, so you never have to worry about not being able to light a fire with your lighter after getting drenched in the rain or a swim. The only thing that we would like to change is the lid – it should be attached to the main body, so it does not get lost. A great idea is to add a shock cord to keep this from happening. Overall, we can conclude by saying that the Exotac Lighter fireSleeve is a must-have for any survivalist, outdoor enthusiast, and bug out bag. And yes, the Neanderthals would have loved to have this lighter! The Windmill Stormproof All Weather Lighter is a quality refillable butane survival lighter that is made of polycarbonate. It has a rubber O-ring seal that makes it waterproof and a tough elastomer armor. You will like the high-visibility blaze orange color that it comes in. You can adjust the flame level anytime. The Windmill Stormproof All Weather also fuels level sight glass that allows you to see when the fuel needs to be refilled. This is a tough survival lighter that you will love having on your outdoor trips, bug out bag and for EDC. Review: To start off, we believe that the Windmill Classic Stormproof All Weather Lighter is a sterling product that has stamina and durability. It is tough and sturdy, making it ideal for all types of outdoor adventures and survival or emergency situations. It functions well too, an important factor in survival lighters. It is possible that you might find better functioning lighters in the market, but not in this size. If there was one thing that we would like to change, it would be the compact size – we find that it is a little too small for most needs. But this is just a minor issue. To finish off, we can say the Windmill Stormproof All Weather lighter is the perfect choice for camping, hunting, emergencies, and EDC. As long as you are not planning a trip to high mountains, this is the lighter for you. Even Jack Reacher would be impressed with it! The Blazer CG-001 Refillable Torch is a butane survival lighter that comes with some awesome features. It has a piezoelectric ignition system that can apply direct heat to any object. You can even use it to light cigarettes, pipes, or cigars (and even roast a marshmallow on!). It comes with a fuel adjustment dial that allows you to control the length of the flame. The Blazer CG-001 Refillable Torch features a wind-resistant blue torch flame that gives you precise control while starting a fire in rugged or outdoor conditions. You can check on the remaining fuel in the lighter with the help of the fuel window. Although it might not work as expected in higher altitudes, this lighter is an exceptional product that is definitely worth the buy. Review: Another great option to consider. The Blazer CG-001 Refillable Torch is an excellent survival lighter to own, that is why we included it on our list. Some users have commented that they owned one for years, and it still works great. We believe that this is one of the most well-made and durable survival lighters out there. A great thing to note is how easy to use and refill is and, of course, how well it works. If you are looking for a reliable lighter for your outdoor adventures or EDC, this one is a solid lighter to pick. If there were any changes that the Blazer CG-001 Refillable Torch needs, it would be the lowest flame setting – it is still a little too high than needed at times. But there are no other complaints. To finish off, we can confidently say that the Blazer CG-001 is a tough survival lighter and you will be making a good decision if you get one as part of your bug out bag or survival kit. You could easily see Longmire with this lighter! 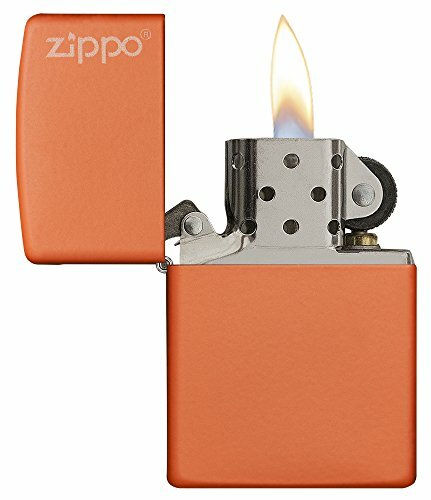 Unique to the shiny lighters you often see from Zippo, the Matte Lighter comes in matte and made from high-quality metal. You will find it in black, white, orange, pink and other colors. It has a windproof design that allows you to use it in virtually any weather. The wick and flints are replaceable, and you can refill the lighter for a lifetime of use. Apart from these features, the Zippo Matte Lighter comes with a lifetime guarantee as well as a warranty with an “it works or we fix it free” policy. This is an awesome advantage to have in case you bang up your lighter during your frequent camping or hunting trips or in a survival situation. Although it is not waterproof, the Matte Lighter is a superb choice for your backpack and survival or EDC kit. Review: We believe that the Zippo Matte Lighter is a great outdoor lighter that works very well. It is everything you would expect from a renowned name like Zippo. It is also worth mentioning that it lights up perfectly every time and has a solid construction that ensures that it will not break even if dropped. We can also add that this is a dependable lighter for any type of situation, whether you are camping, hunting, or in an emergency situation. If there was anything that we would like to improve, it would be that it is not waterproof – that would make it perfect. But all in all, the Matte Lighter is awesome, and although it tends to get pretty hot after even a few seconds of use, if you take into account Zippo’s lifetime warranty, you can be sure that you will have a lighter that will last for years. The Everstryke Pro has been given an all-new design with great features including a replaceable flint and wick which lasts 10 times longer. It strikes incredibly hot with a flame that burns at more than 600 degrees Fahrenheit. The Match Pro also comes with long-lasting matches – each has a capability of 15,000 long-burning strikes. The built-in O-ring prevents evaporation of fuel for an indefinite period. Made of solid stainless steel, the Match Pro Lighter is compact, tough, durable, and easy to use. Although it is not the most windproof survival lighter, the Everstryke Match Pro is definitely a good purchase. Opinion: With its compact form factor, the Everstryke Match Pro Lighter is a great backup lighter as well as for EDC. As we mentioned, it is small and lightweight, making it convenient to carry in your keychain, belt, backpack or pocket. 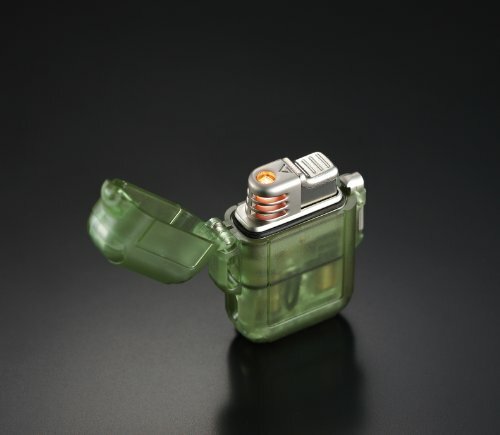 We think that it is the perfect keychain lighter for emergencies. We really like the simple, sturdy, and easy-to-use design. If there is an area that needs improvement, it would be the quality of the stainless steel – it needs to be better. There are no major complaints, we can also add that the Match Pro is a handy lighter that works extremely well as long as you are okay with using a survival lighter that is not windproof. All in all, we believe that you should pick this one out whether for outdoor trips, survival kits, or EDC. As you can see, there are many excellent survival lighters on the market today. You can choose from a wide range based on your specific needs and preference. Whether you are looking for a waterproof survival lighter that you can swim across a river with or one that you can take to the mountains, there is one that is perfect for you. Make that Flame when You need It! Survival lighters today are designed with the outdoorsman/survivalist in mind, so you can bet they are sturdy and durable. They are made with various high-quality materials to ensure that they last many years and perform reliably when you are out in the wilderness or in an emergency situation. Wind-resistant, water-resistant, impact-resistant, Stormproof – lighters these days are built to withstand even the most extreme conditions. You can be sure that finding one that meets your needs will not be difficult of a task.